She was still feeling lost and alone. 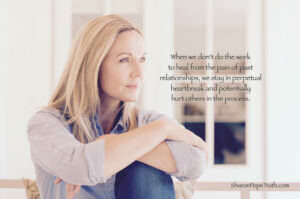 The things we don’t heal after a painful relationship ends, we carry as baggage into the next relationship – even making future loves pay for or overcompensate for all the ways you were hurt previously. For example, if your ex lied to you repeatedly, you’ll likely be overly suspicious of your next love looking for reasons not to trust. You’ll unintentionally sabotage that new relationship if you don’t heal the hurt. It Unnecessarily Hurts Other People. If you’re not ready to date again and you pretend your heart is open and it’s not, you can unintentionally hurt people. My client Emily was dating someone and she was really starting to like and care about him. Until he told her he thought he was ready for a relationship, but he’s not. He’s still not over his ex. And that hurt Emily’s heart. It made her doubt again if she’ll ever find the love she’s looking for. Maybe I’m being too hard on therapists – after all there are a lot of great ones out there (and I’m a product of a great therapist I saw years ago). When we’re hurting….we want to run away from it. When we’re second-guessing ourselves…we stay busy and distracted. When we’re struggling…we stuff it down and power through. But if we don’t do the work to heal from the pain, we just stay in perpetual heartbreak from unhealthy relationships and potentially hurting others in the process. This week, I was featured on Date Night with Connie & Chrissy where I shared the three biggest things that will keep you from finding the love you desire and how to change that to attract the kind of love you really want. Check it out!